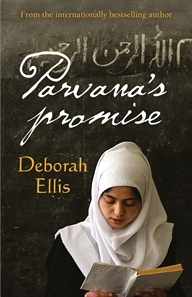 Parvana, now fifteen, is found in a bombed-out school and held as a suspected terrorist by American troops in Afghanistan. A stunning sequel to Parvana and Parvana's Journey. As I started reading this, I realised that I had forgotten most of the details of the first 3 books about Parvana. When I looked back, I can see that there is a good reason for this, as the last story about Parvana (Shauzia) was published 9 years ago, 10 years since Parvana's Journey. What that means is, while fans of the previous books will be looking forward to reading about an old favourite, this book works as a stand alone novel that may encourage readers to go back and read the earlier novels. This story is told in alternate chapters, the opening chapter shows Parvana being taken by American soldiers. They have found her in a bombed out school, and she is suspected of terrorism. In the other chapters, we go back to when Parvana and her mother open the school. A school for girls where they will learn to read and write, but also other skills such as sewing, cooking and basic medical care. In the chapters where Parvana is imprisoned she does not speak, no matter how persuasive the soldiers are. I did worry that this book would be quite graphic in relation to Parvana’s torture, but it wasn’t. She mentions photos she had seen of Afghani women who had been tortured by American soldiers, but she does not suffer the same fate. What Parvana endures are other non violent forms of torture, such as being made to stand for long periods of time and having to listen to the same song being played non stop in her cell. The story of the school being built is a positive one, but knowing that it doesn’t end well, made me angry, as you can see the hard work and commitment that was put into it. It is a glimpse at the good work that is being done in Afghanistan, by Afghani people, but we also see that there is still a lot of resistance, especially when it comes to the education of girls. One of the things I liked most about the story is that even though we know right at the start that the school was destroyed, we don;t know why or how. That informations unravels as the story is told, and even when I thought I knew what had happened, everything changed, when Parvana speaks for the first time, and we hear what actually happened.